Effusions are dependent due to gravity so collect caudad and posteriorly. They are easily identified between the diaphragm and lung at the Postero-lateral point. Large effusions will extend to the other points too. 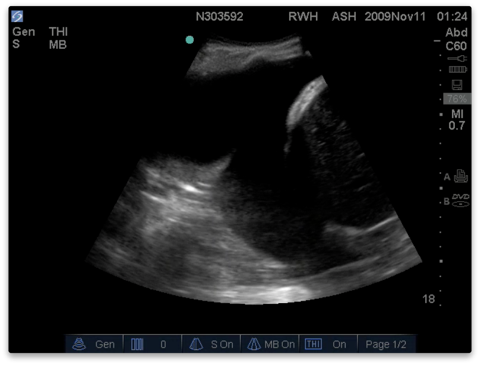 Lung US will identify the presence, size, and nature of an effusion and guide thoracocentesis. The lung will float on top on an effusion. Up to 500mls of fluid is easily missed with a CXR and sensitivity and specificity of US are higher than CT and approach 100%. US will also reveal septations and can distinguish between transudates and exudates. A septated effusion with adherences between lung base and diaphragm. 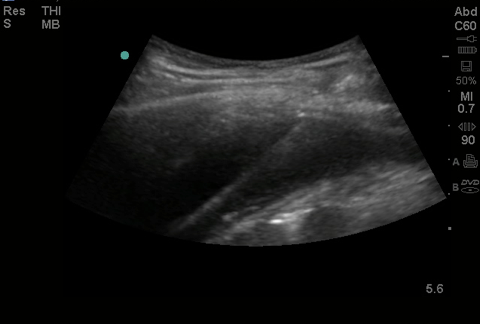 Consolidated basal lung with 1 comet tail visible (not a B line as does not arise from the pleural line). 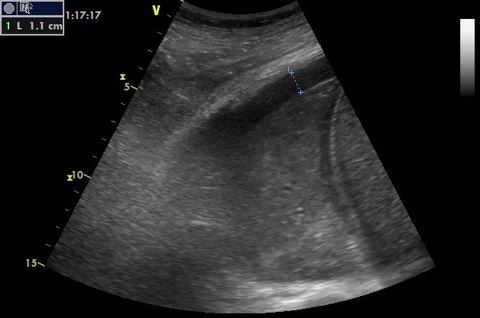 The quad sign - With the diaphragm out of view an effusion will be seen as a rectangular shape (usually anechoic but not if blood or pus) whose borders are the ribs cephalad and caudad and the parietal and visceral pleura at the top and bottom (the visceral pleura here is termed the ‘lung line’). Lung will be seen below this and its appearance will range from normal aerated through to consolidation. It is imperative not to confuse an A line for the lung line. Putting an M-mode line through the effusion will reveal the sinusoid sign as the lung moves towards and away from the probe with respiration. This sign will be abolished with very viscous effusions. With the diaphragm in view at the postero-lateral point a significant effusion will be seen surrounding the basal lung and separating it from the diaphragm. Atelectatic or consolidated lung base is commonly seen floating around. 1. Is the effusion large enough to cause compression? 2. Is the lung completely or only partially 'consolidated'? 3. Drain the effusion and see if the lung re-aerates. 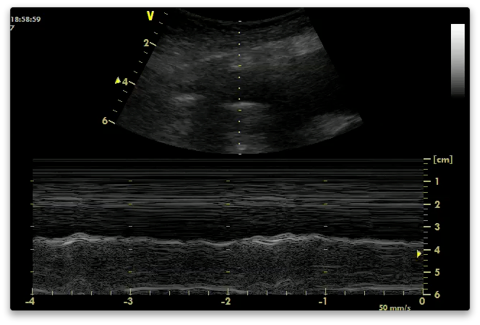 The sinusoid sign - pleural thickening can mimic a pleural effusion very convincingly. The way to distinguish the 2 is to observe the lung moving towards the parietal pleura with respiration. This can be demonstrated nicely with M-mode. The sinusoid sign. The black space is the effusion. The wavy line underneath is the lung moving towards and away from the parietal pleura with time. There are a number of sizing guides to effusions which vary significantly. Lichtenstein’s PLAPS index measures the distance between the pleural line and the lung line at the posterolateral point. It is measured at its greatest size (ie in expiration). A PLAPS index of 1.1cm i.e. 75-150 ml effusion. Note the consolidated lower lobe. It resembles the liver echo texture (hepatisised) - see alveolar syndrome. The effusion is small while the lower lobe is completely consolidated. This cannot be atelectasis from compression - it is pneumonia with an associated effusion. A massive effusion. The depth between the pleura is 6cm. The lung here could easily be compressed (atelectatic) by the effusion rather than being consolidated. The lung may completely re-aerate once the effusion is drained. Where to measure? Not always straightforward! Filtration of pleural fluid overwhelmed - iatrogenic fluid overload, CCF, ↓ protein. US means effusions can be safely tapped to determine their precise nature. Any suspicion of an exudate should prompt a tap. This can be done in real time in plane or the site can be marked. Marking is easier but it must all be done at the same time without the patient having been moved. Marking in the radiology department and then tapping on the ward is asking for trouble. The site selected should be where the effusion is largest and as far removed as possible from other structures (lung, liver, spleen, heart). There should be a reasonable distance between the pleura in inspiration to avoid pneumothorax (minimum 1cm depending on skill). Tapping can be done with a green needle (if the effusion is of low viscosity - anechoic, sinusiod sign). Evacuation can be done with 14 or 16G cannula or a small seldinger drain. Lichtenstein suggests positive microbiology in around 15% of taps. This improves lung function and mechanics according to several studies. Drains are commonly used to achieve this but it is perhaps better to use a 14-16G cannula and a 50ml syringe. This avoids infection risk from an indwelling drain (which are frequently left in long after they have served their purpose), is simpler and means there are no dressings to get in the way of repeated US. - A space (usually anechoic) between the parietal and visceral pleura. - Respiratory movement of the lung within the effusion (‘sinusoid sign’). 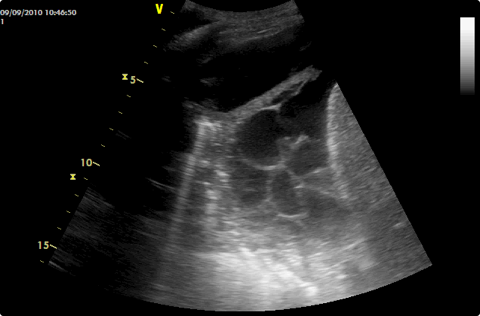 A pleural effusion with internal echoes suggests that it is an exudate or haemorrhage. While most transudates are anechoic, some exudates are also anechoic. Thoracentesis may be needed for further characterisation. 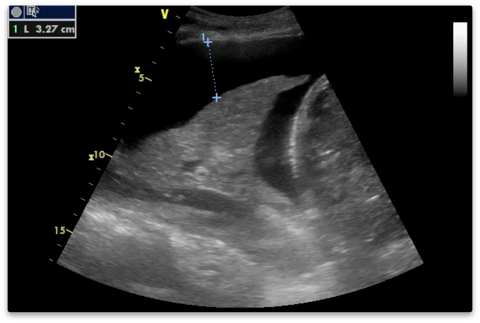 In the evaluation of pleural effusion in adults, the micro-convex transducer is preferable. If not available, a phased array or a convex transducer can be used. 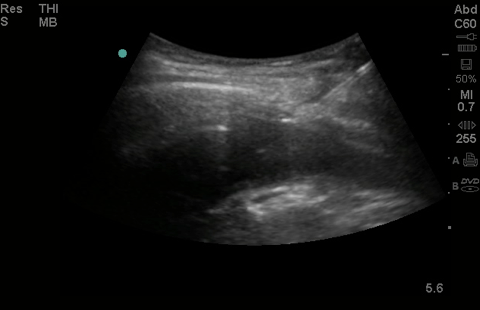 The optimal site to detect a non-loculated pleural effusion is at the posterior axillary line above the diaphragm.